The latter guarantees resistance to impacts, loads and torsion so that the door remains functional (remains a door) and retains its compartmentalisation capacity. What happens if a door loses the capacity to function as a door? You can have a good burglary-resistant or fire-resistant door, for example, but if it no longer closes properly, then it no longer serves its compartmentalisation purpose. If the door no longer works properly as a door, then there is no point to its safety features. The safety features of the door are important but they are usually only needed occasionally (if there is a fire, an attempted break-in, etc. ), whereas mechanical resistance is a permanent benefit. European standard EN 1192 "Doors. 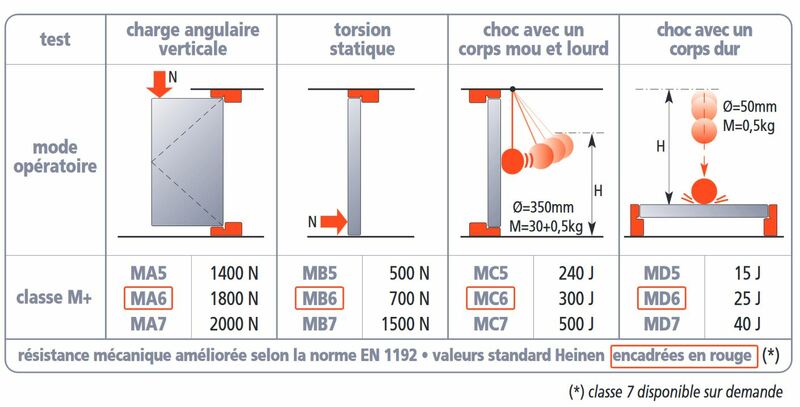 Classification of strength requirements" provides a classification method for the performance of door leaves, frames, door sets, door sets assembled according to their resistance to vertical loads, static torsion, soft and heavy impacts and hard impacts. Special requirements, such as those for burglary resistance or safety requirements relating to glass infillings are not covered in this standard. One of the basic performance features of Heinen Metal+ hung doors is class M+7 Improved Mechanical Resistance (IMR) to avoid premature ageing due to accidental or intentional impacts. 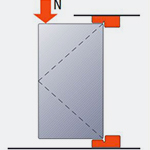 A variable load is applied in the plane of the door leaf open at 90°, at the point furthest from the hinges. 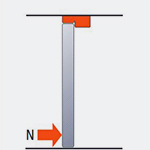 A variable load is applied perpendicular to the door leaf when closed, at the bottom point furthest from the hinges. 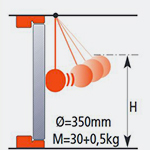 A soft sphere, of fixed diameter and mass, suspended on a cable, collides with a vertical door set. 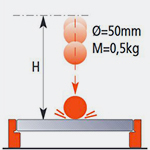 A hard sphere, of fixed diameter and mass, is released above a horizontal door set.